The biggest eSport event of the year starts next week! 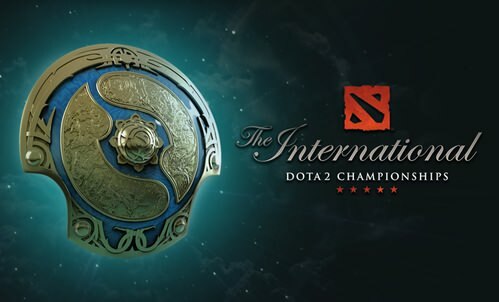 DOTA 2 - The International takes place 7th – 12th August and has already generated a current prize pool of over $23,000,000 and is continuing to grow. The biggest names in DOTA 2 will be competing in what could be the biggest prize pool in the history of eSports. 1. Get instant access to your account with direct home page login. 2. A streamlined wagering menu means placing a bet is easier than ever before. 3. All pages (including Live Betting) will now load faster. Christmas has come early - Pinnacle’s new Casino is here! Pinnacle’s new Casino launches with over 1,000 fantastic games on 22nd December. To celebrate, we’re counting down to Christmas with a €500,000 giveaway. Plus you can pick from player favourite games like Mega Moolah, Golden Fish Tank, Vikings Go Berzerk, Highlander and Cherry Blast and we’ll be launching a new game every two weeks. Get ready for the 2018 Australian Open! Predict the winner of the Men’s and Women’s singles tournament and you could win €8,000 (or equivalent based on the currency of your Pinnacle account). Pinnacle recently announced its partnership with multiple singles Grand Slam winner Mats Wilander and to celebrate, we’re giving you the chance to win €8,000*. Mats has made his picks for the tournament, now it’s your turn! As it begins its landmark 20th year of operations, online bookmaker Pinnacle has reached a new milestone with the announcement of former world no.1 tennis star Mats Wilander as its first ever brand ambassador. 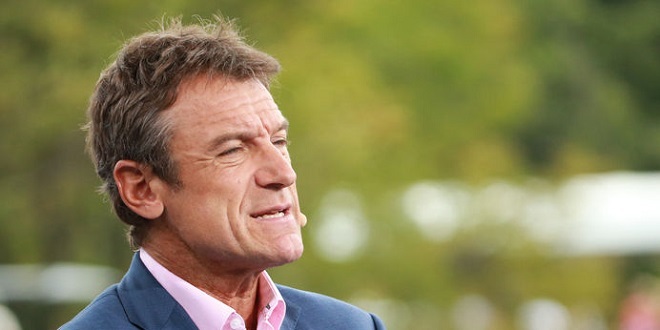 After an illustrious 16-year career as a professional, Wilander will produce educational content for Pinnacle’s Betting Resources portal – providing readers with unique insight into the game. The Swede is a multiple Grand Slam winner, with three Australian Opens, three French Opens and one US Open to his name – as well as just short of $8 million in career prize money. Now aged 53, Wilander retired from playing in 1996, and has coached a number of high-profile players since then. Wilander has already settled into his new brand ambassador role and written an in-depth 2018 Australian Open preview. Pinnacle has celebrated the announcement with the launch of their “The €8,000 Slam” competition – giving customers the chance to win €8,000 for predicting the winner of Men’s and Women’s Australian Open singles tournament. 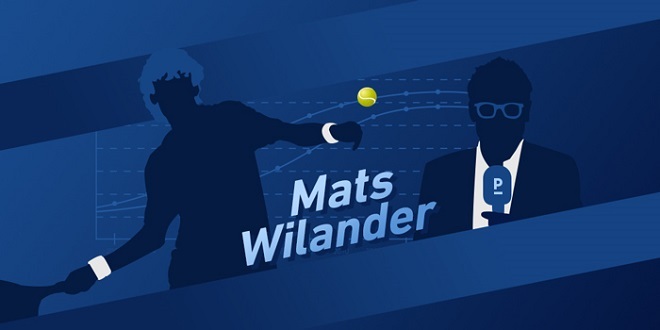 Mats Wilander is a multiple Grand Slam winner, former world number one, and one of only two players (along with Rafael Nadal) to have won at least two Grand Slams on all three surfaces. Now retired, the Swede has become the new brand ambassador for online gaming platform Pinnacle. We caught up with him to find out what he intends to bring to this role. SBC: Hi Mats, firstly, why have you chosen to become Pinnacle’s brand ambassador, and what do you believe you can achieve in this role? Mats Wilander: It was an easy decision to be honest. I have a great relationship with the people at Pinnacle and I like the way they do things. It’s refreshing to see a company be so upfront and honest with its customers and that’s something I can certainly relate to. I know the guys there are excited about the content I’m working on and so am I. I enjoy talking about tennis, analysing the game and giving my opinion. I think my experience from playing provides me with a unique perspective and hopefully that will help me educate Pinnacle’s customers about tennis. SBC: Spending decades at the top end of tennis, what do you believe you can offer the firm? MW: Tennis is a complex sport and I guess only someone who has spent their life being involved in the game has a real understanding of its intricacies. Whether it’s my knowledge of different players and their styles or how the surface and conditions can impact performance, I know Pinnacle is keen to share my insight with their customers. 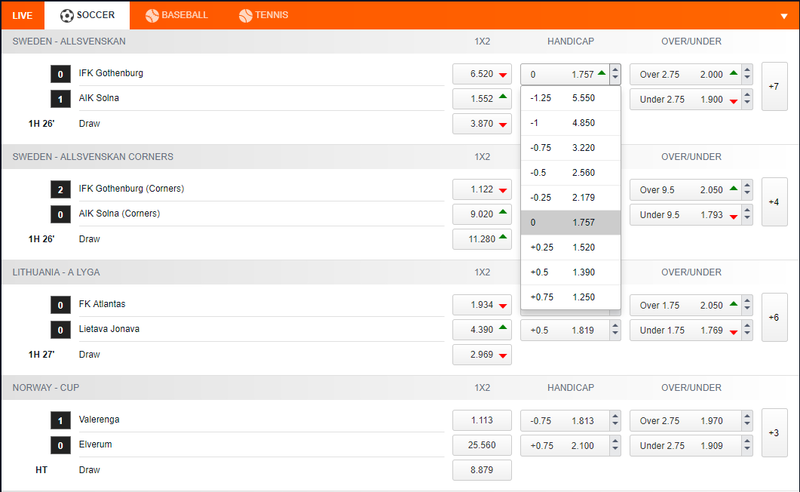 You have already penned an Australian Open preview for Pinnacle. Do you see yourself creating more content like this, and how do you see the rest of the tournament unfolding? MW: Most definitely. I’ve already written another article that analyses what will happen in the tournament after the quarterfinals and will probably write another one or two before the finals this weekend. Moving forward, the plan is that I’ll work closely with the content team at Pinnacle and write more articles for the remaining three Grand Slams at least. As for the rest of the Australian Open, I think the level of tennis we’ve seen is going to keep improving. Melbourne Park has the second-fastest courts in the world (behind Shanghai on the ATP tour) and players will now have a feel for the court and will be used to the bounce. If you want any more information on what might happen, you’ll have to read my article! Great news for all who got Bitcoin crypto currency. From now you will be able to deposit and withdraw money in Pinnacle with Bitcoin! ISLE OF MAN – Pinnacle has integrated with Microgaming’s award-winning Quickfire platform. 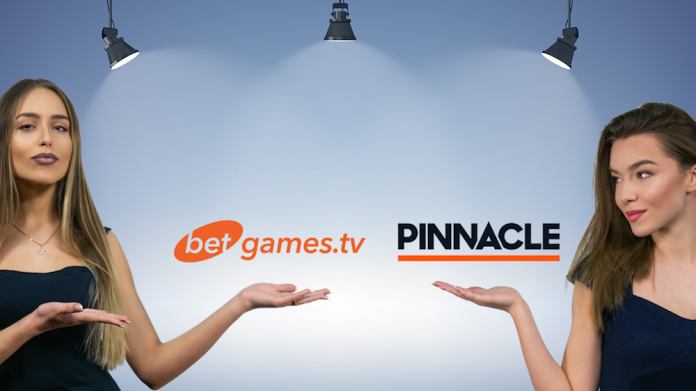 Founded in 1998, Pinnacle is a respected industry leader, delivering sports betting, casino and educational betting-related content to customers worldwide. Following a deal with Quickfire, Pinnacle .com players will be able to access over 600 Microgaming casino games and the industry's largest progressive jackpot network, as well as a wide range of development partner content from over 20 integrated specialists. Pinnacle can also utilise Quickfire iQ, a powerful set of modules designed to enhance gameplay, increase player engagement and extend lifetime value. Pinnacle Solution currently boasts two product offerings: a plug-in iFrame API featuring a sportsbook skin, mobile compatible site, risk management services, four different odds formats and multiple currencies, all available in 13 different languages. Pinnacle also offers a turnkey solution for customers who currently lack their own gaming site. 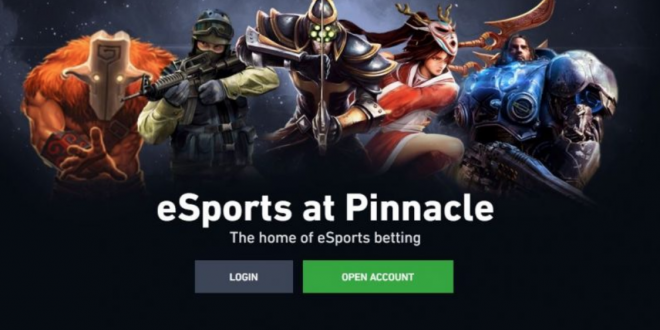 Pinnacle believes its new B2B service offers three main features that would-be sportsbook operators will find enticing: an award-winning eSports offering, ‘increased profit potential’ based on a 4% hold of betting handle, and ‘unbeatable odds’ via Pinnacle’s famously low margins (average 3.7% vs. industry average of 7.2%), which Pinny says are low enough that operators can increase them to boost profits while remaining competitive. At the recent Betting on Football Conference in London, Pinnacle CEO Paris Smith made no secret of the company’s desire to return to the US market. 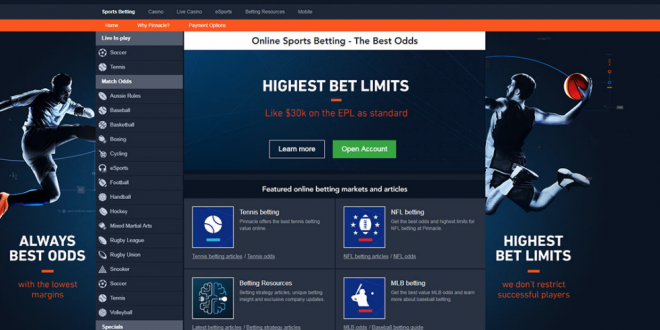 The company’s previous incarnation Pinnacle Sports exited the US in 2007 following passage of the Unlawful Internet Gambling Enforcement Act (although it didn’t begin IP-blocking US bettors until 2012). Assuming state or federal regulators can overlook its previous US escapades, Smith believes Pinnacle has “a pretty strong foothold in a lot of markets where US sports are very popular so we have the experience and knowhow to provide” services such as oddsmaking and risk management if, as widely expected, the Supreme Court overturns the PASPA federal sports betting prohibition. 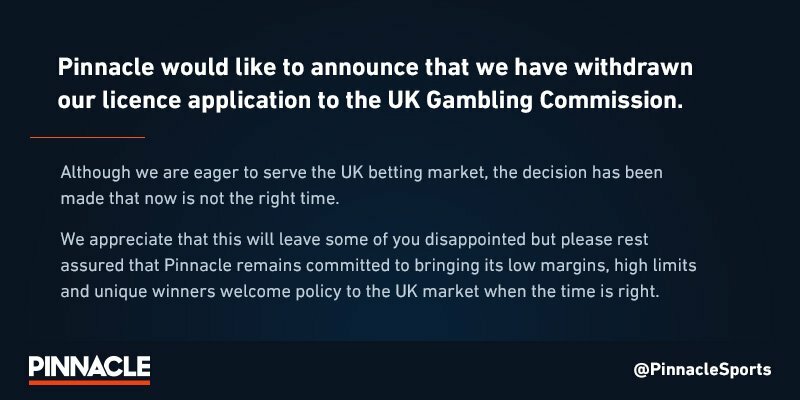 Updating its social media channels, Malta & Curacao-licensed online betting operator Pinnacle (Pinnacle.com) has confirmed that it will no longer be seeking a UK Gambling Commission (UKGC) licence. The low-margin bookmaker published the following update on its Twitter feed and Facebook group. In 2015, under the guidance of new ownership, Pinnacle one of the industry’s oldest online sportsbooks, set out its new strategic vision of primarily expanding its services within regulated European markets. Pinnacle would secure a Malta Gaming Authority MGA2 license in March 2015, allowing the operator to offer its sports betting services within European member states markets (subject to local regulatory conditions). Following its Malta MGA2 approval, Pinnacle stated that it would apply for a UKGC licence with the company initially targeting an early 2017 launch for its UK sportsbook product. However, since its initial UK application, Pinnacle has seen little to no progress on securing its UKGC licence with the operator being placed under commission review for some months. Last week, Pinnacle announced the launch of its new B2B sportsbook platform ‘Pinnacle Solution’ seeking to leverage its proprietary technology and knowledge of low–margin trading for new industry clients. Moving forward, it is believed that Pinnacle’s leadership will prioritise the growth of ‘Pinnacle Solution’ for its regulated market presence. 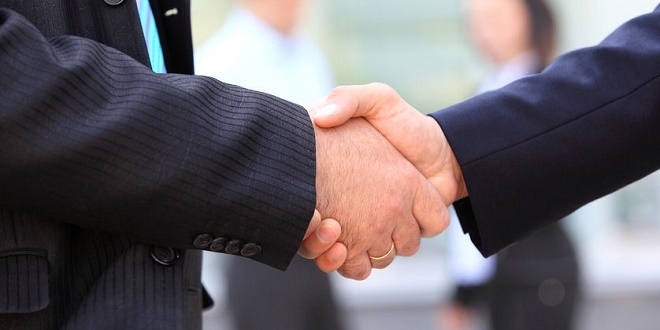 Provider of omni-channel solutions for gaming and betting operators worldwide NSoft has made an agreement with leading online operator Pinnacle. The company’s games range is now freshened up with NSoft’s virtual games suite. Players will now have a chance to enjoy in Draw Based Games such as Lucky Six, Next Six and Lucky X as well as in Virtual Sports Betting Games Greyhound Races, Virtual Greyhound Races, Virtual Horses and Virtual Motorcycle Speedway. This year, Pinnacle is celebrating two decades of successful business. The brand is available to players in over 200 countries around the world, offering the best possible odds. The company is fully licensed and regulated by the Government of the Netherlands Antilles, which requires the company to have the funds available to honour the winnings of its customers at all times. This collaboration enables NSoft to further introduce its premium content and boost its operations. NSoft is keen to keep up innovating and has already lined up a range of new products. Carlos Vargas, NSoft Business Development Manager stated: “We are thrilled to be part of Pinnacle’s two decades of success with the signing of this agreement. I feel confident that their customer base will enjoy our products and this liaison will be very beneficial for both parties”. “Pinnacle is very excited to add NSoft to our product portfolio. NSoft is known in the gaming and betting industry as a provider of innovative online games, and through this new partnership, we continue to enhance our customers’ experience with complete and world class virtual game offerings” said Paris Smith, Pinnacle CEO. Pinnacle customers have been given the chance to hit a World Cup jackpot this summer, with the bookmaker’s €20,000 Shoot-Out competition. As well as the main €20,000 prize, the highly-regarded online operator is offering €10,000 to anyone who can answer the “Golden Goal” question. The promotion rewards predictive skill with ten yes or no World Cup related questions. Anyone who answers all ten right has the chance to win the €20,000 jackpot. In order to win the €10,000, customers need to predict the total goals + total corners + total bookings in the tournament. In addition to the customer-facing competition, The Pinnacle World Cup is also taking place on Pinnacle’s Twitter feed. A series of Twitter polls, accompanied by data-driven content based on stats from the history of the World Cup, will be used to determine the best team in World Cup history. Pinnacle have also posted The Pinnacle World Cup as an outright market with the 1970 Brazil team the early favourites at 4/1, and 2014 winners Germany one of the outsiders at 16/1. The €20,000 Shoot-Out competition is open until 6th June, while The Pinnacle World Cup will run until 13th June.